The presence of eye bags is a common problem that affects people regardless of age, gender, or ethnicity. Eye bags are typically caused by genetics, as often seen in younger people, or age-related where fat around the eyes prolapses forward. The initial response of many people is to try under eye creams that claim to get rid of eye bags. 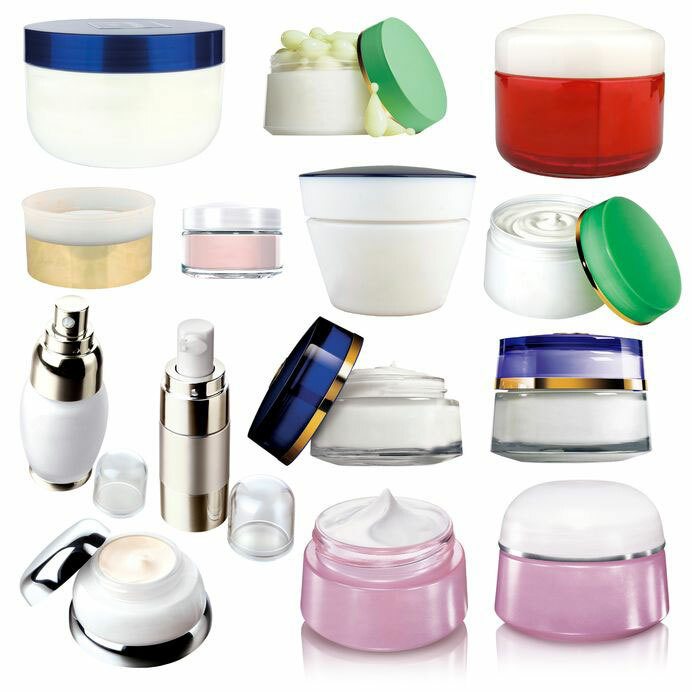 Under eye creams cannot melt the fat that causes eye bags, while leaving the lower eyelid skin unharmed. Eye bags can be seen at almost any age. I have treated three generations of the same family for eye bags. The youngest patient I treated was 14-years-old, and many people who come to me are in their 20s and 30s and have been aware of puffiness under the eyes since their teens. Under eye puffiness that’s always present, and makes one look tired and older is caused by a condition called lower eyelid fat prolapse. This means the fat normally around your eyes has pushed forward, creating a bulge, which is why it’s called lower eyelid fat prolapse, and also called herniated fat. 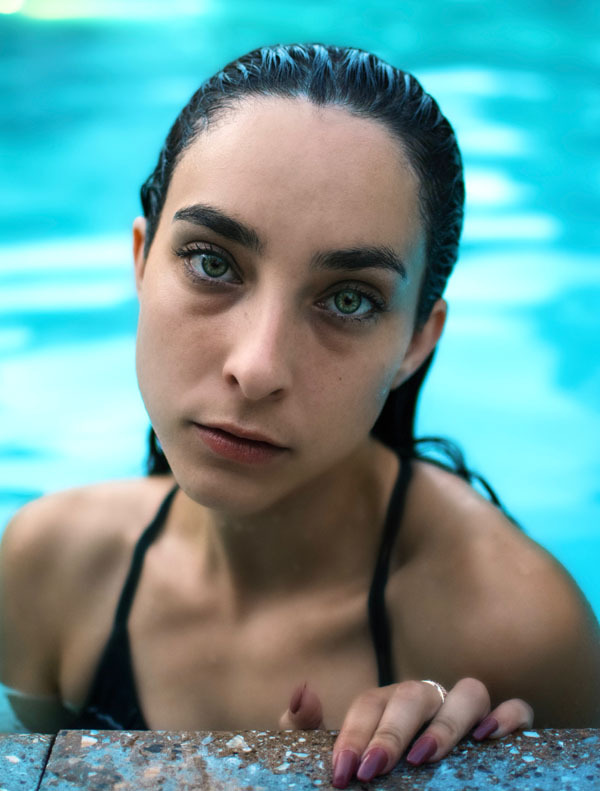 Eye bags are a genetic issue, and not necessarily associated with aging, so even young people can have them. Lower eyelid prolapse differs from temporary causes of eye bags, such fluid associated with allergies, sinus problems, salt intake, and hormonal fluctuations. While these can all cause puffiness, they are usually intermittent. These temporary causes can also make the under eye puffiness due to fat appear worse. Creams which claim to eliminate under eye bags, don’t work because they cannot physically reach the deep fat pockets and have any effect. 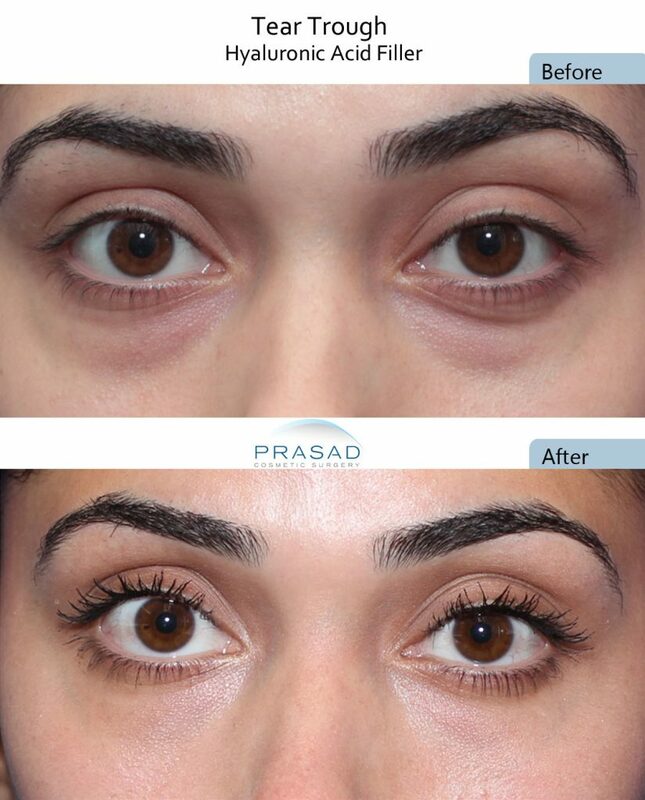 The best way to fully correct eye bags is through surgery to sculpt and remove the displaced fat pockets. Only surgery can sculpt and remove the fat that causes eye bags. While cosmetic eye creams can’t reduce eye bags, they can improve the quality, texture and color of skin under and around the eyes. I developed some skin care products which are designed for this purpose. There are basically two strategies to help improve the appearance of under eye bags. If someone has slight fat prolapse pushing forward, and has a certain anatomy of the bone structure under the eyes where there is space in the tear trough, fillers such as a hyaluronic acid filler in the Restylane or Juvederm family can be used to blend the transition between the elevation of the fat pocket and the hollow of the tear trough. Soft cosmetic fillers can camouflage mild eye bags. This approach to camouflaging lower eyelid fat with filler has been very useful in our practice to help patients with minimal fat prolapse and under eye puffiness. If someone has more severe eye bags, the more definitive treatment is surgical, called a lower eyelid blepharoplasty. Most general plastic surgeons perform this procedure with an incision in the lower eyelids, right beneath the eyelashes, and sometimes remove lower eyelid skin attempting to improve wrinkles. 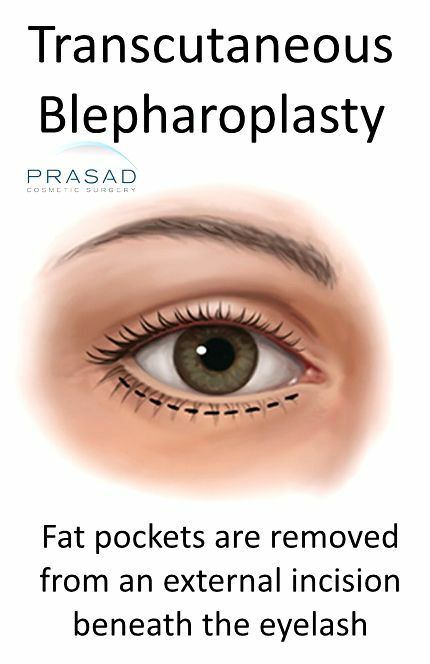 Transcutaneous blepharoplasty is the more common eye bag surgery, but is also more prone to complications. 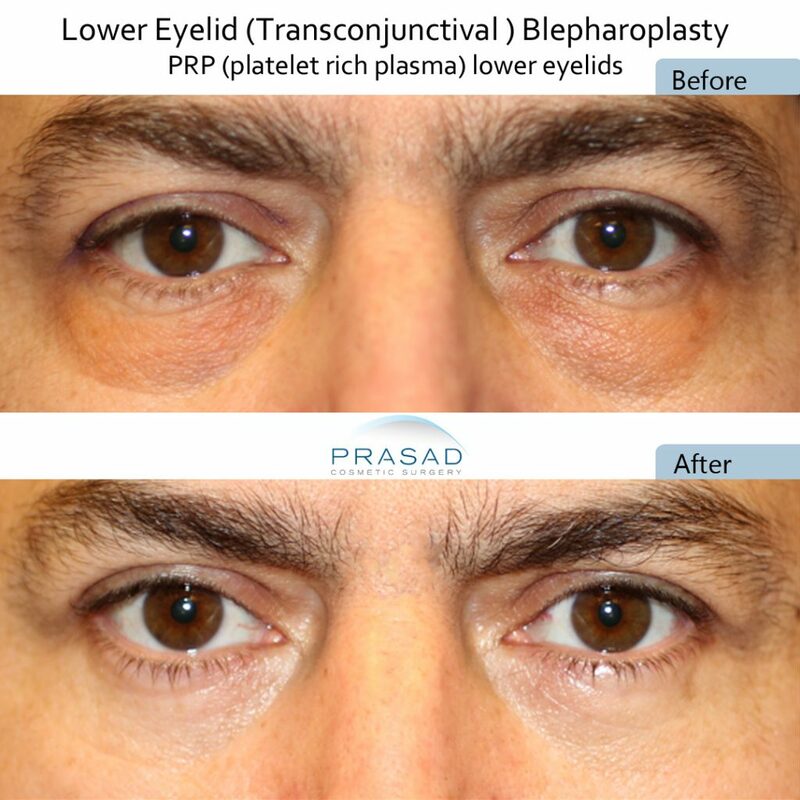 This approach is called transcutaneous blepharoplasty. I see a lot of patients who’ve had this procedure complaining of losing the shape of their eyes because the lower eyelid is pulled downward. I also see a number of patients who’ve had complications from this procedure like lower eyelid retraction and lower eyelid ectropion. These conditions result from skin shortage under the eyes and compromising of lower eyelid support. 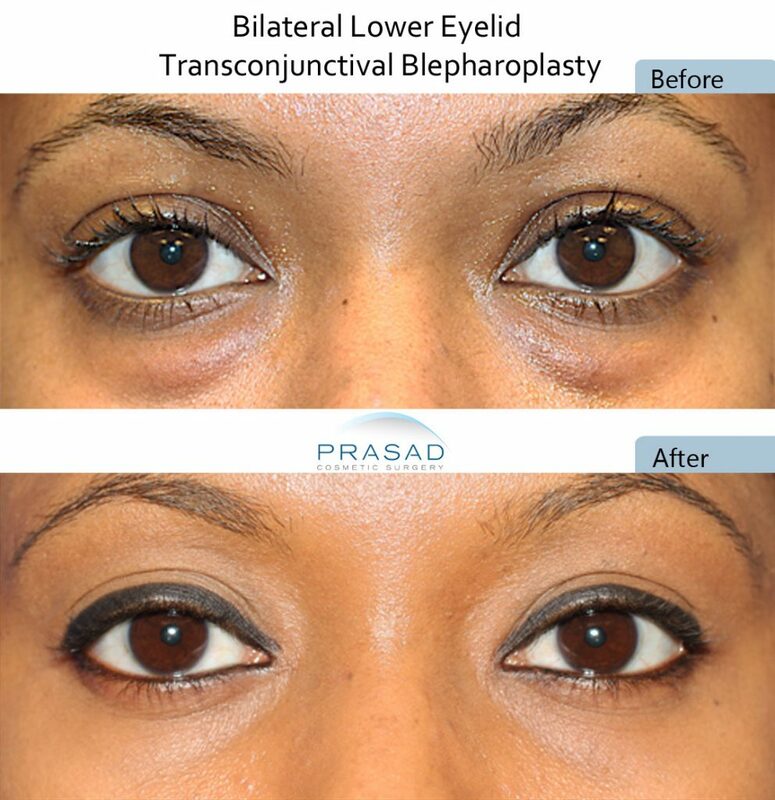 My procedure of choice is transconjunctival blepharoplasty. I feel this approach is a minimally invasive procedure that allows me to address under eye fat pockets surgically from the inside of the eyelid. Transconjunctival blepharoplasty involves no external incisions to remove fat, is less prone to complications, and looks completely natural. There is no external incision or effect on the supporting structures of the lower eyelid. I essentially reduce and reshape the fat to address the puffiness so you no longer have bags under your eyes while maintaining the natural shape of your eyes. The goal is to appear as if you never had bags under your eyes. This has been a highly successful procedure with faster recovery that allows my patients to return to work in about a week. 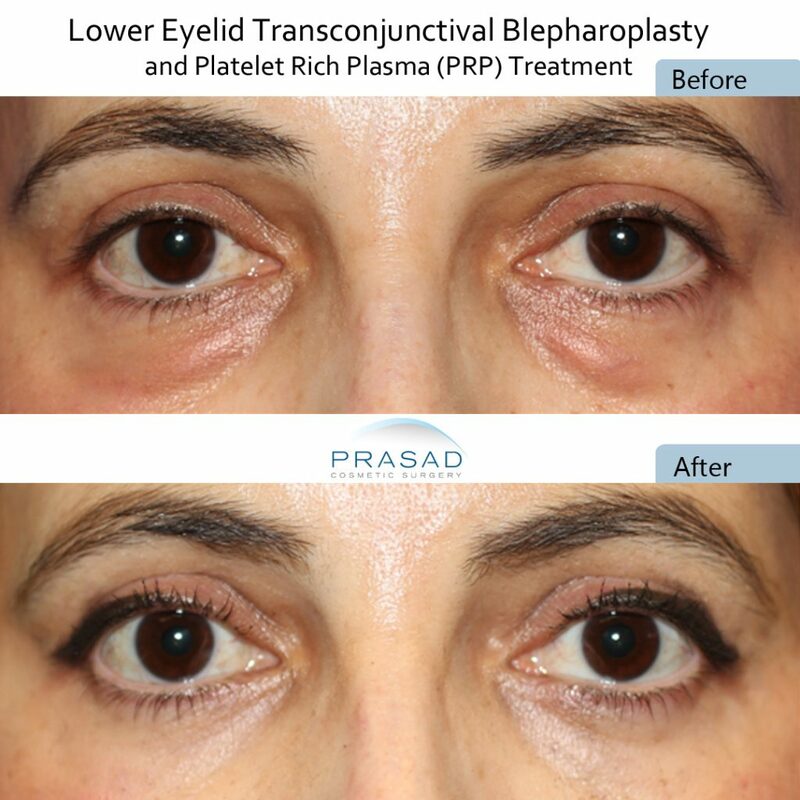 While still surgery, transconjunctival blepharoplasty is minimally invasive since it involves no visible incisions. We routinely perform this procedure under local anaesthesia with LITE® IV sedation in our Joint Commission-certified facilities in both our offices. For many patients who come to us from all over the world for this procedure, they like that they don’t have to go to a hospital or surgery center, and can comfortably have the procedure done, and go home soon after surgery. Not using general anesthesia makes patients more comfortable, and makes their recovery much faster since they are not recuperating from the effects of general anesthesia. 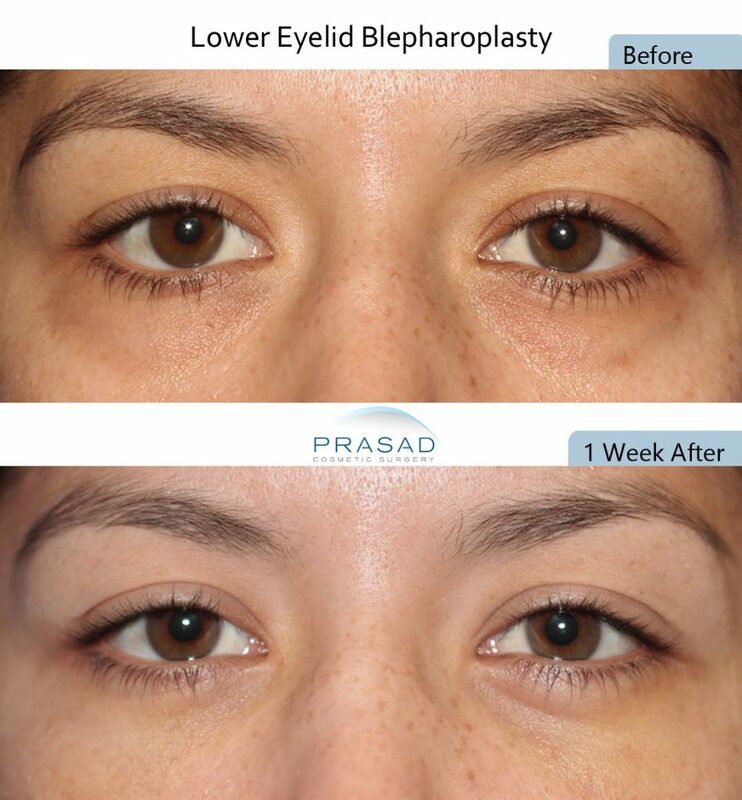 Dr. Prasad’s transconjunctival blepharoplasty procedure done under local anesthesia allows patients to look pretty good just a week after surgery. If eye bags are your concern, don’t waste money on creams. When you understand how the underlying lower eyelid where fat pockets which have prolapsed forward are responsible for these under eye bags, buying creams as a treatment doesn’t make sense. I recommend you meet with qualified and experienced cosmetic surgeons to learn about your options which are filler placement to camouflage, or surgery which is more definitive.